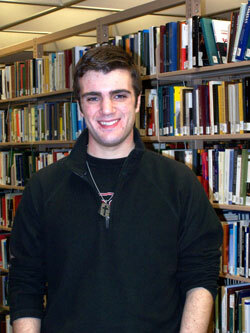 James Cautillo has been selected Falvey Memorial Library’s Student Employee of the Month for April. 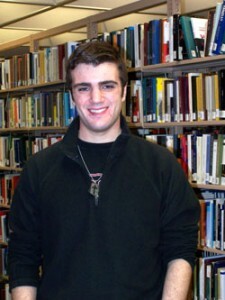 James, a sophomore humanities and mathematics major, works for Access Services where he scans documents, shelves books, helps at the Circulation desk and assists with Garey Hall remote retrieval. James, from Winthrop, Mass., plays the piano and is learning to play the guitar. He loves hiking and is interested in karate, astronomy, theology and literature. Phylis, manager of Access Desk Services and also the Library’s University Staff Council (USC) representative, initiated Student of the Month as an appropriate way to honor student workers. When the Falvey USC team asked department supervisors for nominations of outstanding students, they “received so many that our team is finding it a difficult task to choose,” a nice comment on the quality of Falvey’s student workers. Article and photograph by Alice Bampton; the sketch of James posted on the pillar behind the Circulation desk by Joanne Quinn.